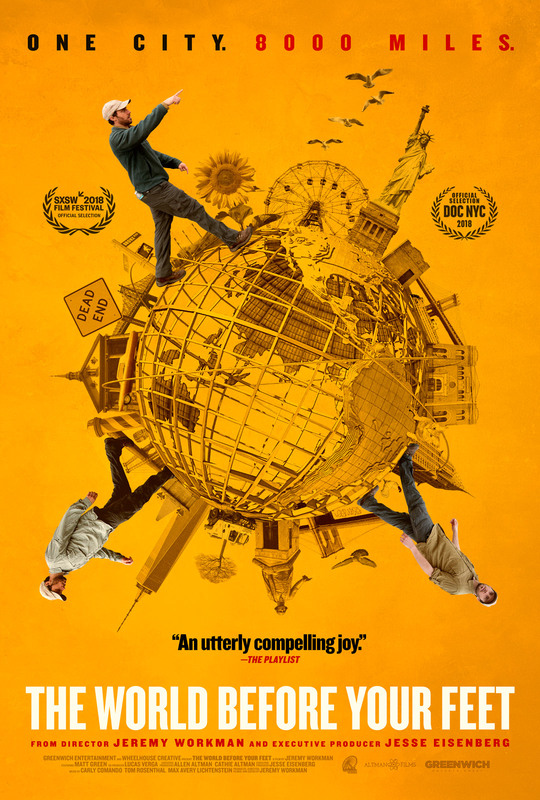 This is the original review of THE WORLD BEFORE YOUR FEET WHICH ran when it premiered at SXSW. I'm reposting because it begin it's theatrical run Wednesday which means you too can see it's wonders. Jeremy Workman is one of the best filmmakers I've run across. He finds these wonderful off the beaten path people and makes absolutely compelling films that change the way you see the world. 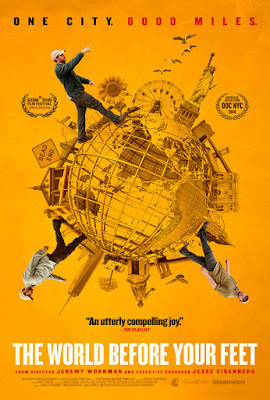 His latest film THE WORLD BEFORE YOUR FEET has just premiered at SXSW and it is absolutely a charmer. The film is a portrait of Matt Green who has been walking all of the streets of New York City for the better part of the past decade. We watch as he walks the streets, meets people, and takes pictures of what he sees. We also get to know Matt via interviews with friends, family and ex-girlfriends. You would think that a film about a guy walking would grow tiring but it doesn't. Thank to Jeremy Workman's expertise we find ourselves falling in step with Matt and his crazy walk. Workman makes sure that we are always full engaged by thinking ahead and answering all of the questions we might have at just about the time they pop up in our heads. He's so good at providing answers to everything that despite my initial thought that I would like to do interviews concerning the film, I can not in good conscious think of more than one or two things that aren't addressed in the film. What makes the film work is that the film isn't just about Matt and his walk but about the city and the people in it. Matt isn't just walking the city but documenting it as well on his website. Researching what he sees he details what the things he sees are on line. Within the film he details things like the movement of the Jewish communities out of neighbors as witnessed by the synagogues being turned into churches, and how the various neighborhoods deal with tragedy as witnessed in the wide variety of 911 memorials. Matt also engages everyone he meets and as a result we get a portrait of the people across the city. What thrilled me was that watching Matt walk and listening to him explain what he's seen I've been forced to rethink how I see the world. As someone who loves to walk around New York he opened my eyes to a good many things that I always took for granted. This film has left me speechless. I need to see this film a couple more times to fully appreciate everything that is in it. Jeremy Workman is a genius. Yes I’ve drunk the Kool Aid, but if you’ve been following his career since the start you’d be in line for a refill as well. No one is making films quite like his and as a result we are the better for it. His films are not one and done, “what’s next?” affairs. They are fascinating portraits of outsiders who are revealed to be not so outside. This brings me to THE WORLD BEFORE YOUR FEET. It has haunted me since I saw it. There is something about the film that has stayed with me. I’ve been pondering how Matt Green sees the world. Thinking endlessly about how he linked up the history of the city. Mostly I’m just wondering how much of New York I haven’t seen even in the sections of the city I know. And I can’t stop thinking about the film. Is it one of 2018’s best films? Oh yes. For me a film should really at least one of two things entertain or inform. World does both. Watching Green wander the city and talk to people is a blast. It simply is fun. We have a genuine good time as we travel along with him. Additionally it tells us things we probably didn’t know. In being a curious person and needing to fill in details for his website Green has become a human encyclopedia of NYC history and we are better for it. Thank you Jeremy Workman for something truly special.